#PKCP8000 | In stock, Ready to ship! "this is a very good looking pen and must to a collection or for a sale, it goes together easy, its operates smooth, very good instructions on how to assembly, if you have not done one got to try, I got the pack of three." "I have sold many of these pens. A standard item for me." "The finish of the gold is outstanding,like the looks of this pen,made pens from walnut,this time from white pearl.The pen came out amazing,everyone like the pearl finish." 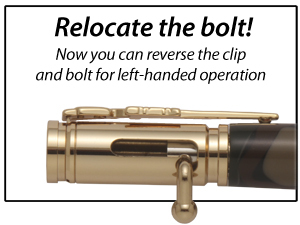 "30 cal.bolt action pen kit ,great quality, great finish, easy instructions to assemble the pen kit, very stellar looking, gave to our son as a gift, any one interested should buy this pen kit, also changed the blot action so the bolt acts like a real bolt action going down,great for left handed persons, our son is left handed and like it very much." "Fantastic product, selling like hotcakes"
"At first I was a bit concerned that the recess for the bolt to catch into would be too shallow and not be very functional, but that was before I finished the pen. Once completed, that worry went away quickly. The bolt is solid, both in the open and closed position. I would suggest not using a light wood for this pen. either use a heavier wood or an acrylic blank. In short, a very beautiful pen that everyone that see's it, wants it. I would recommend it to anyone that likes bullet pens." "I love these pens. Easy to make and addictive once you start. They also sell very well, specially the camo pens." "This pen kit is one of my best selling kits, everybody loves them! I make a lot of them with Deer Antler bodies on them. I also got a little creative and made a stand for this one in my woodworking shop and took my wood burner and burned 2 images of deer. This is a display for maybe a desk." "The guys really like this handsome pen, great for the hunter, outdoorsman or shooting enthusiast. War veterans male and female like them too. Very easy to make with a single tube and assembly is a snap." $30 Any kind of wood with a nice grain. $40 oak burl, maple burl, olivewood, etc. $45 various woods. cocobolo, sycamore, bocote, maple, mesquite. $52.5 Price depends on material. $65 Thin Blue Line blank and gun case. $67.5 Varous Hardwood. ( pecan ,oak,bocote,A. blackwood.